Facebook founder Mark Zuckerberg and his new bride Priscilla Chan have been found honeymooning in Rome — and slumming it for lunch — but eagle-eyed netizens have also spotted the couple in a Chinese TV documentary about high-tech police methods in that country. 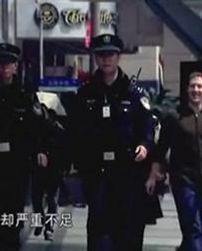 As it happens, the two visited Shanghai in late March and were also photographed wearing the same clothes as in their onscreen cameo. But it’s not clear many Chinese viewers will even recognize the Silicon Valley wunderkind — Facebook is banned in China, you see.